President Obama’s approval rating is dropping like a rock. 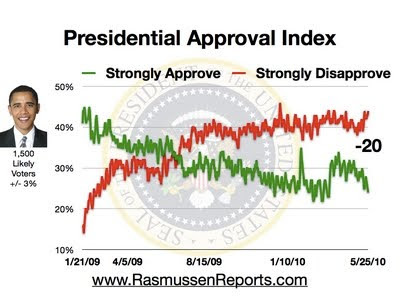 The latest Rasmussen Presidential Approval Index has Obama at -20, with only 22% of those surveyed “strongly approving” of his performance as President. 42% “strongly disapprove” of Obama’s performance. His all-time low in the Presidential Approval Index is -21. The overall tracking poll numbers have shifted dramatically against Obama. The President’s overall approval is now at only 42% at least “somewhat approving” of him, with 56% disapproving. That is a new low for Obama. Just this past Saturday, the rating was 48%-52%. That is a ten point change in three days. Rasmussen: The Rasmussen Reports daily Presidential Tracking Poll for Tuesday shows that 24% of the nation’s voters Strongly Approve of the way that Barack Obama is performing his role as president. Forty-four percent (44%) Strongly Disapprove, giving Obama a Presidential Approval Index rating of -20. . . .